I’ll just say this: Brett is taking a LOT fewer pieces of clothing than I am. 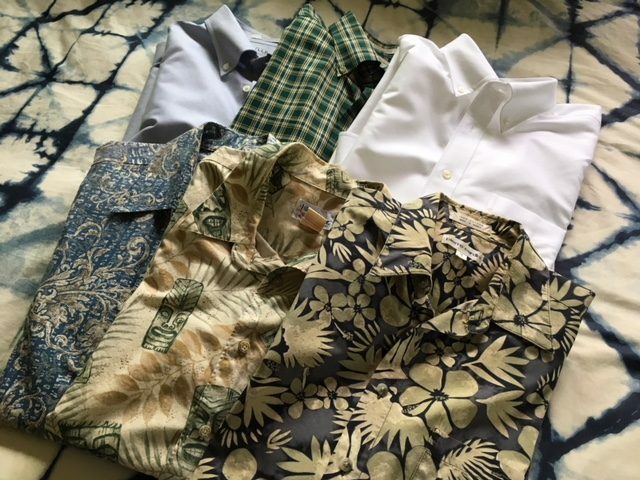 He’s bringing six cotton shirts – three aloha shirts for warmer weather, and three long-sleeve buttondowns for when it’s cooler, or to go under a sweater. Two of the three aloha shirts are Reyn Spooner – we bought them at Goodwill back in Portland, with tags still attached, for $6.95 each (similar Reyn Spooner shirts retail for $98). The oxford-cloth shirts are all from L.L. Bean – they are easy care, don’t need ironing, and wear like iron. 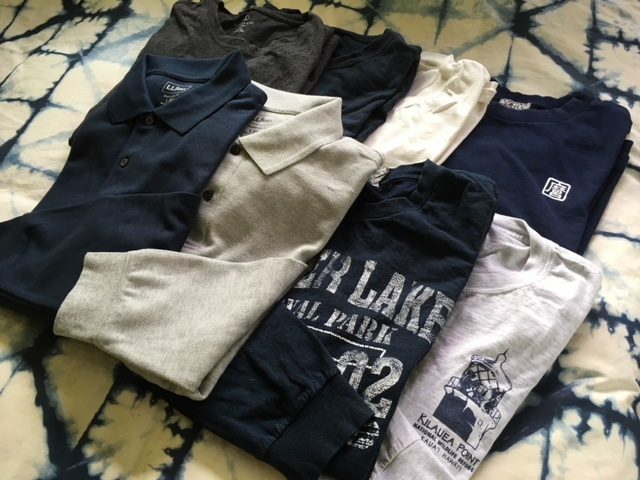 Knit shirts include the four short-sleeve t-shirts in the top row (dark gray, black, white and navy), two long-sleeved polo shirts (navy and light gray), and two long-sleeved souvenir t-shirts (navy Crater Lake and light gray Kilauea lighthouse). 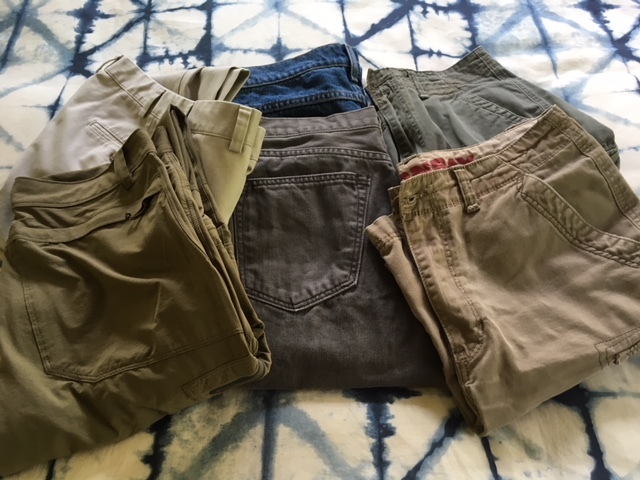 He’s bringing along seven pairs of pants: three pairs of jeans (two blue, one gray – he was wearing one pair when I took the picture), a pair of khaki chinos, one pair of lightweight travel pants (lower legs can be zipped off), and two pairs of cargo shorts. 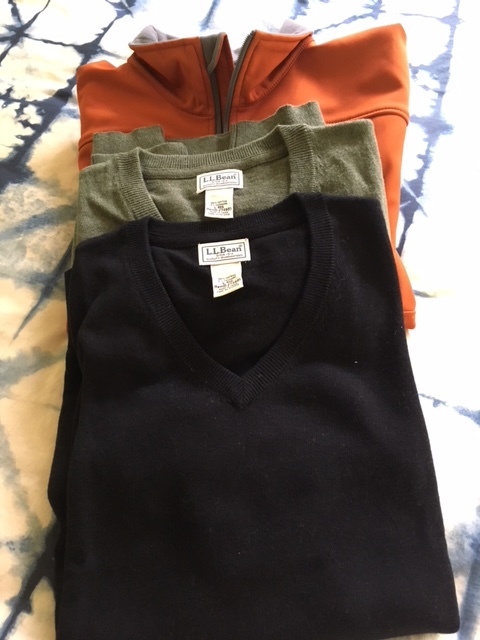 For staying warm, he’s packing two cotton-cashmere v-neck sweaters and his orange all-weather jacket that we found a couple of years ago at Costco. He also will be bringing along his trusty navy watch cap that he’s had since boot camp back in 1970. 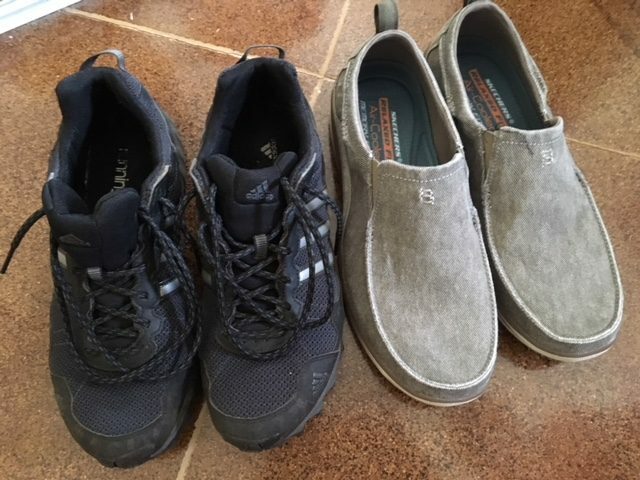 For now he’s got two pair of shoes: canvas Skechers slip-ons which are great for strolling around, and his navy sneakers for more strenuous walking. He’s planning to get a pair of leather shoes, but hasn’t decided yet what he wants, and he’s also going to get a pair of Keen sandals. As with my stuff, pretty much all of his clothes were bought on sale, or using gift cards or coupons. Besides his socks, underwear, and sleepwear, that’s it. What can I say, the man likes to live lean. I will probably be tired of his clothes before he is. Ah, men. It seems easier to be them on the wardrobe front, no? We are just back from a warm weather break with friends and I think I carried twice what my DH did. Of course, I didn’t wear all of it. And I do carry a lot less than I used to. We mostly needed swimsuits and coverups with something a little more dressy for dinners, but I could have left several things home. And we went from 85 degrees to 18 degrees on the return flight, so the down coat was bulky but necessary. My DH had that Kilauea lighthouse shirt in navy blue from one of our visits. He literally wore it until it fell apart. Is there a blueprint on the back? What a deal on the Reyn Spooner shirts! Wow. And I’m dying to see Big Little Lies, but haven’t figure out a (free) way to get it yet. ha! Brett is conditioned by 22 years in the navy, where he wore the same outfit every day. He is a minimalist when it comes to clothes, and always has been. Plus, he will wear things until they are literally threadbare. All of his things will get worn during our travels, but I’m confident he’ll add a couple of pieces as we go along. Brett had the navy Kilauea shirt before this one, and wore it until it fell apart! When we went last year he bought himself a new one, this time in gray because his sister had gotten him the navy Crater Lake shirt when they did their road trip in 2015. Goodwill was THE place to find aloha shirts when we were back in Portland – huge variety, but all just $6.95, including new ones. The Reyn Spooners were an especially nice find. Can you do the free month of HBO Now? I’ll have to check it out. We don’t have cable or dish, so not sure. But worth looking! I had a good chuckle reading your post as I pack for my travels like Brett, plus 1 or 2 colourful and lightweight scarves. I often receive a surprised or stunned reaction from my family and friends when they see me my ‘luggage’. My travel fantasy is to go on a trip with my passport, e-tickets, credit cards and some cash and that’s it. Unfortunately now I should also bring a mobile device and its accessories which altogether would weigh more than my other essential items! For any other bit of travel I’d be packing less than Brett, and going with a carry-on, but I cannot imagine going through nine months of travel with this amount. We’ll be doing a couple of those passport only trips when we’re on the road, and carrying just a backpack. We’re planning to do three days in the CinqueTerre when we’re in Italy, a couple of days in Switzerland and a day trip or two into German when we’re in Strasbourg. We will be packing very light for those. Ok, that was fascinating! Love to see what others pack. Personally, I would think of it as two trips, pare down the luggage by half, and send a box to a friend in Portland with the rest. You could retrieve stuff or trade out when you are there at Christmas and have a better idea what you will really need. But that’s me! I also love my lightweight down sweater for traveling. Takes up a lot less space than a traditional jacket and is toasty warm! Hi Jen – we thought of sending some of our clothes to Portland, but had to toss the idea because of where we’re going and when. When we start out in August it will be HOT, not just here but wherever YaYu ends up attending school. So, summer wear and sandals will be required to have on hand. After that we head into cooler weather, both in South America and Europe, and of course in Portland in December. It’s 2019 though where things get tricky – India will be cold, Hong Kong so-so, and then Australia and New Zealand will both be HOT, especially Australia. When we arrive in Japan though it will be cold again, but be quite warm again by the time we leave in mid-May. So . . . we decided to take it all. We will mix our things between our two suitcases, so if one gets lost no one will lose everything, and of course we’ll be carrying an additional outfit in our carry-on backpacks (I’m taking along a pair of leggings for just the reasons you outlined for your lightweight long underwear). I’m already underweight with the packing, and Brett even more so, so I think we’ll be OK. The Senior Nomads have been traveling with full-size checked luggage for over four years, and so far so good, so we’ve got our fingers crossed we’re as fortunate. Hi Laura You must be so excited. Have you heard of Uniqlo they sell some amazing very lightweight gilets and jackets which pack down into very small stuff sacks. I have one of each and i carry them in my back pack when travelling. I know Uinqlo – we don’t have one here on the island, but WenYu and I shopped at one when I took her to college. We looked lots of affordable stuff, and she bought sweatpants to wear when it’s cold. LOL – I had to look up what a gilet was in American English – we call it a vest, which I think is what an undershirt is called in British English. Sigh. Anyway, this was good information – I’m sure we will see Uniqlos all over the place as we travel. I know they are very popular in Japan. The green padded vest and black jacket I am taking are supposed to be able to fold small enough to fit into one of their pockets! I haven’t been able to do that, but they do fold down very small and are very, very lightweight (but amazingly warm). Anyway, I now know that if anything happens to them I can find a similar product at Uniqlo – thank you! !